In Oregon we have two composite leading indicator series and while our office publishes an analysis each quarter in our forecast document, we do not regularly highlight the overall series here. 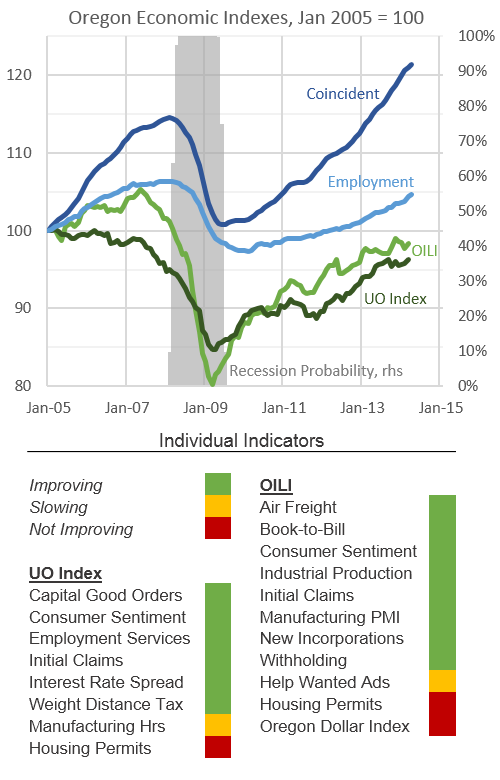 This is partly due the fact our office focuses here on the blog on specific leading indicators from time to time and also that the University of Oregon index is publicly released each month. With that being said, I will begin posting this quick summary of the leading indicators each quarter where one can gauge which series are up, which are slowing and which are not showing improvements. Right now nearly all the indicators are pointing toward a continued economic expansion. While this has largely been the case for quite some time now, a few indicators have recently turned up including new business filings with the Secretary of State’s office. After falling considerably during the recession, in late 2013 and early 2014, the numbers have started to increase again. Hopefully we will have more on new business formation and entrepreneurship in the not too distant future, but for now, it’s at least moving again in the right direction. The two indicators that are yellow, meaning their improvements have slowed recently, are actually doing pretty well from an overall perspective. Both the total number of help wanted ads and the average manufacturing hours worked are nearly back to pre-recession levels, however these indicators have plateaued in recent months. The housing stall has taken the sails out of the housing rebound over the past year and the combination of a bit stronger U.S. growth and mediocre at best economic news around the globe has the Oregon dollar appreciating against out major trading partners over the past year. Lastly, you may notice that the pace of the leading indicator series has been slower in the past year or so. It is important to point out that these composite leading indicators are used as a green light – red light indicator and not a measure of the magnitude of the growth. Overall both continue to show sustained improvements thus indicating continued economic growth in the near future.